I completed a trade on Instagram, finally, with one of the people I have talked to the most from there, a guy named Jackson. I traded with his brother, Carson, quite a few times, and even once with their dad, Tim. Turns out, Carson is on the same baseball team as my friend Matthew's brother, Jason. Small world. 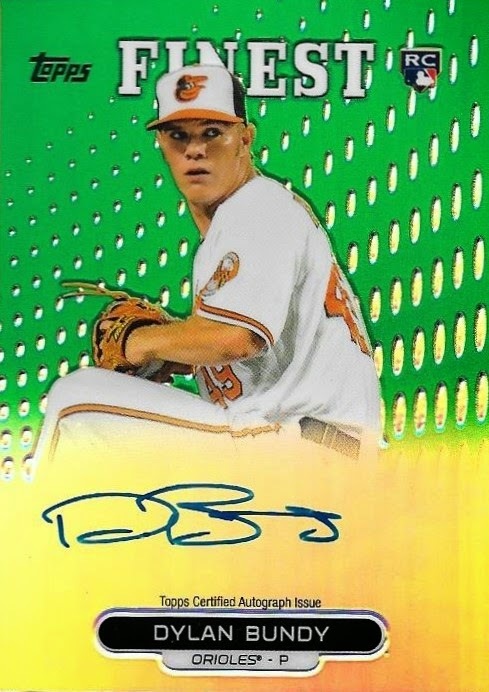 Anyway, I had a bunch of trade bait listed on my instagram page, and Jackson had been asking to do a trade for a while, so we finally had a match when he offered me this awesome Dylan Bundy auto from 2013 Topps Finest. This green parallel is numbered 74/125 and the auto is on card. Really sharp card. 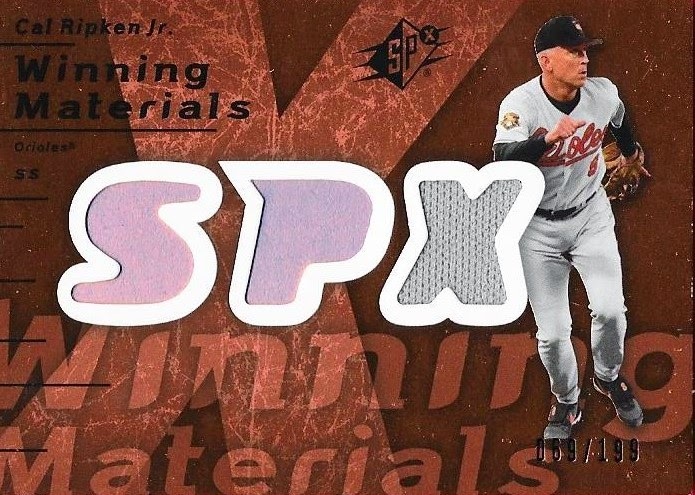 Not only did I land the Bundy, but Jackson also included this 2007 UD SPX Cal Ripken relic numbered 69/199. I already had a couple of these SPX relic cards, even a 3-piece one, but I was glad he included this. 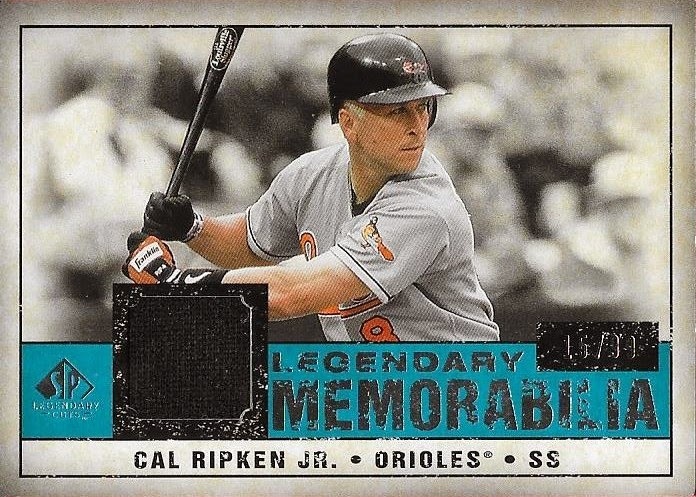 Finally, I got this 2008 SP Legendary Cuts Cal Ripken relic. 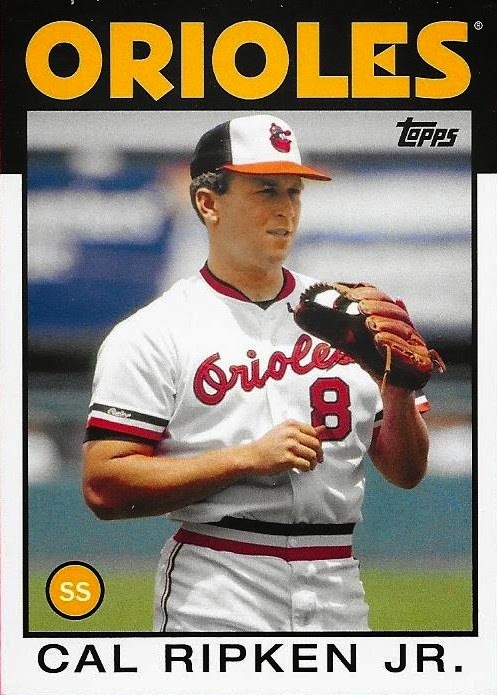 This was one of the rare Ripken cards that I didn't have in my collection. This one is numbered 15/99, so the cards Jackson sent me were all low numbered and well worth the trade. He won the deal, but it didn't matter to me. I'm just glad he is happy with what he got. Some of the kids on Instagram need to take lessons from Jackson and his brother, Carson. They are both awesome people and I am so happy to be trading with them. Jackson sent my son, Chris, some really nice stuff, and that gesture isn't lost on me. Thanks so much for the trade, Jackson! Here is another of the cards that I picked up off of COMC recently. 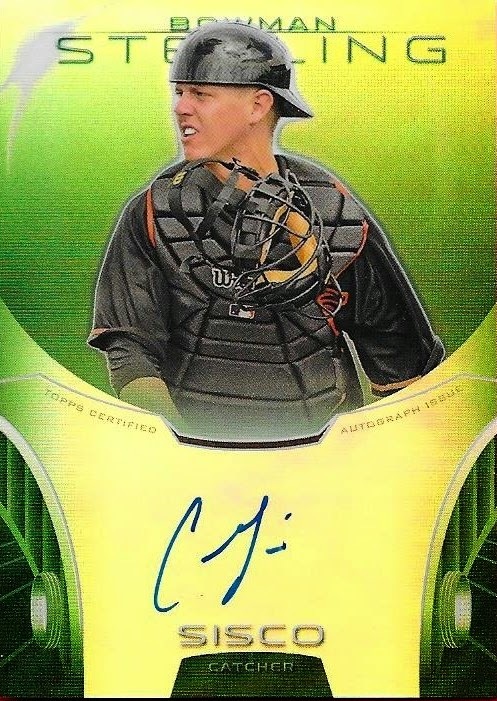 I got this 2013 Bowman Sterling green parallel auto of Chance Sisco for $6.75 worth of store credit. Not too bad, since I saw Sterling base autos of Sisco going for $5.00 at the last card show I went to. I remembered lamenting the fact that I passed on grabbing one of them, but luckily, I got this one, This card looks so much better than the base ones anyway. Sisco is having some kind of season this year. Tonight, he went 3 for 4 with a homer for Delmarva. On the season, he is batting .338 with 143 hits (113 games) and 5 home runs. Wow. That is really good. I would love it if the Orioles had a few high average hitters on the team. You know, guys you could count on to hit .320 or .330 perennially. I guess, in these days, that is really hard to come by. Well, Sisco is doing well in the lower levels of the minors. He should be headed to Frederick, next season. Let's hope he can sustain this success, but I have to keep reminding myself that he is only 19. I got a nice surprise package from fellow blogger, Schuyler, the other day. His packages, while few and far between, are always welcome. Schuyler does something that I wish some of the folks on Instagram would take note of and that is that he included a nice, long letter in with his cards. Schuyler is a sharp guy, taking aeronautical engineering in college now (more power to ya, buddy). I met Schuyler through my amazing friend, Drew. I've known these guys for 5 years now and I have to step back a bit and realize that I have seen these guys (and Scott, too) grow up and move off to college. I was lucky enough to meet Schuyler in person last summer when I went up to hang with Drew. Watching these guys grow up and move off to college is really awesome. I know they will not have a lot of time for cards and blogging while they are in school, but knowing that all of this stuff will be here waiting for them when they graduate, its a cool feeling. I'm glad I meant enough to Schuyler that he wanted to keep in touch and send a nice letter. The cards were really ancillary. I really appreciate the thought, Schuyler and I wish you the best as you embark on your (tough) college career. Check out Schuyler's blog, Schuyprism. It is a really good read and is a little different than most card blogs. 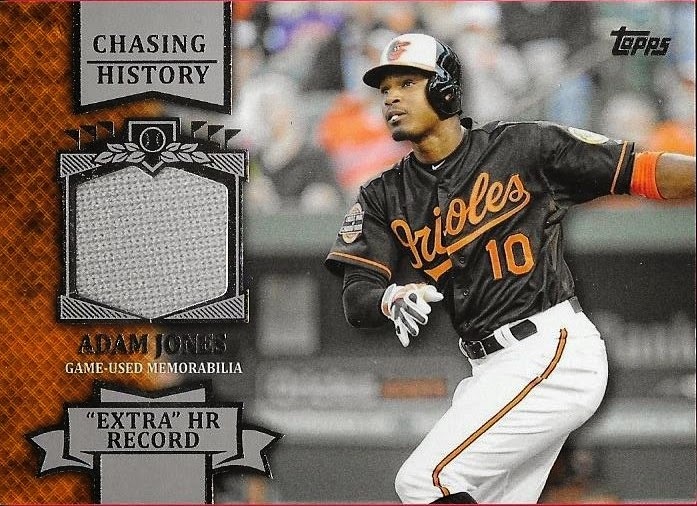 I completed another quick and easy trade with my buddy Carson on Instagram when I picked up this 2013 Topps Chasing History Adam Jones relic in exchange for some cards that I don't quite remember. That's normal, though, because I think I have traded with Carson the most off of Instagram, so far. If I haven't, he has to be at least in the top 3. 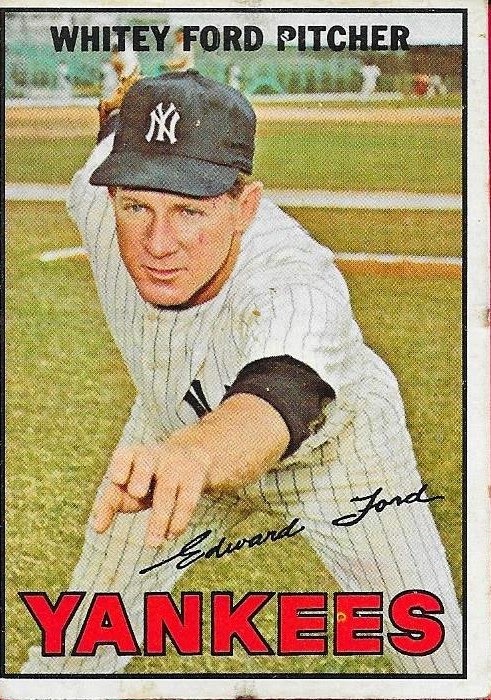 He comes from a family of traders, as I completed a huge deal with his dad for my 1969 Mantle, among other things, and I just completed a trade with his brother, Jackson, for some Cal relics (which will be shown soon). Carson is also one of the youngest people trading on there, at 11 years old. He seriously knows his stuff and has a great eye for cards. Thanks for the trade, Carson! I completed a trade on Instagram with a kid named Ethan a while back that landed me a few Hall of Famer cards in exchange for some stuff that I don't even remember. I should take better notes. 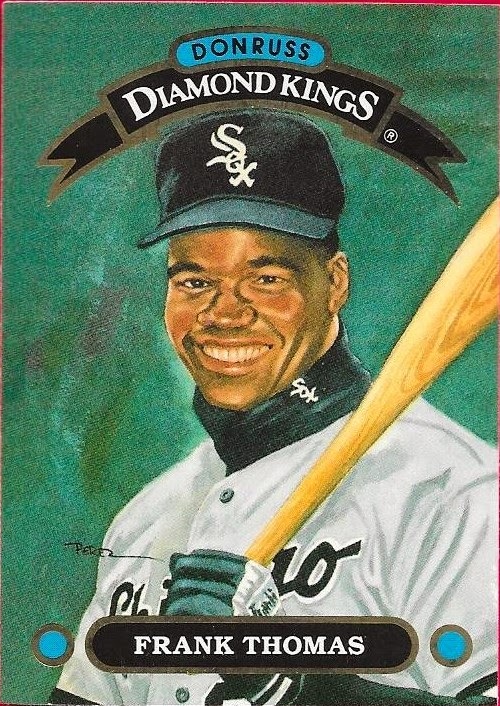 Anyway, the key to the trade was a few Frank Thomas cards, like the 1992 Donruss Diamond Kings card seen above. These are still awesome cards and I was glad this was added to my pile. 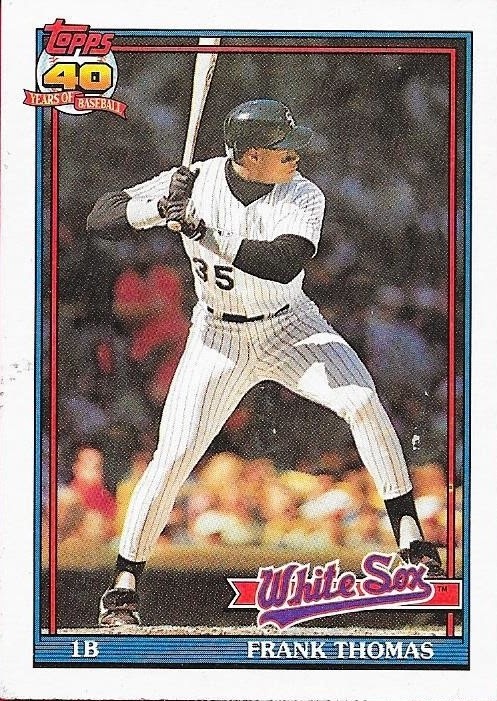 The other big piece was this 1990 Topps Frank Thomas rookie card. I think I have one around here somewhere, but who knows where I sat it, so I had Ethan throw it in the trade. The card that started the trade was this numbered 2009 Topps Legends of the Game Brooks Robinson, which, surprisingly, I didn't have. I had unnumbered ones, but none of these that were numbered to 99. Weird, right? Another weird thing was that Ethan kept saying that the card was damaged. I see no damage to the card, so I don't know what he was referring to. Oh well, the trade is complete and I like the cards. That's all that matters. I completed another trade with Shawn from Instagram, part of the Shawn, Sean and Alex trio of Cubs fans that I have been conversing with on there lately. 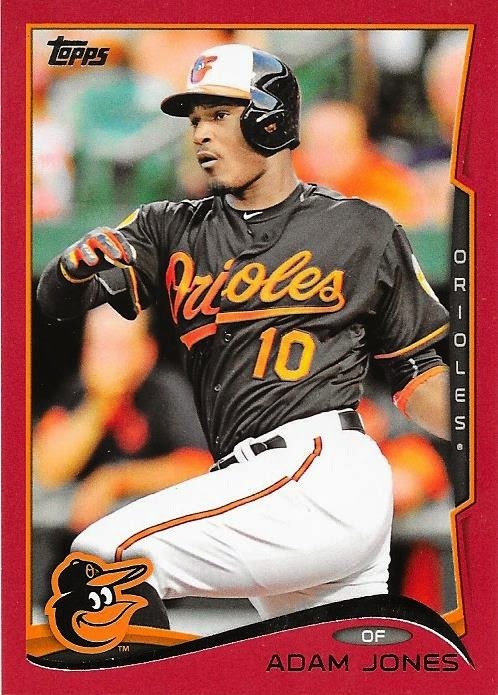 This time around, I sent Shawn some Cubs cards in exchange for three 2014 Topps Target red parallel Orioles: Adam Jones (above), Miguel Gonzalez and Brian Matusz. Shawn is really easy to trade with and I have sent him a couple care packages in return and also a Levon Washington autograph that I got for a steal on Ebay. The triumvirate of Shawn, Sean and Alex are all really good guys and I plan on trading with each of them again in the future. I know this because I have piles building up for each of them that I plan on sending, once I feel that they are big enough to send out. I've really enjoyed the interactions I've had with folks on Instagram. It has opened up a whole new forum for trading, and I feel like, for the most part, I've had a positive experience. There are a couple kids on there who need to be taught some manners, but mostly, they are all good folks. These three guys are definitely some of the better ones I've met. I got a nice surprise package in the mail recently from my good friend, Nick, over at Dime Boxes. Nick is, by far, the best blogger around. His mini collections and just all around joy for just about any kind of cardboard is a real sight to see. He finds so many things to like about cards that I (and others) may miss. I send him stuff every now and then, and in return, I get mailers from him as well. 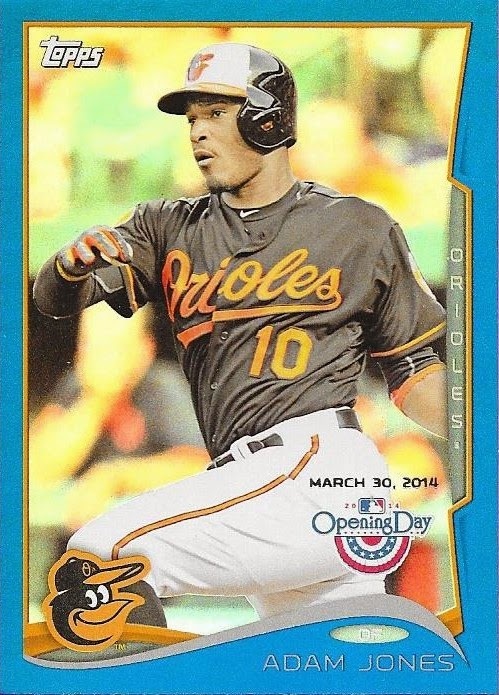 This time around, Nick hit me up with a bunch of Orioles parallels and oddball cards. One of which, I didn't yet have in my PC was the above 1989 Kahn (KAHHHHNNNN!!!!!!) 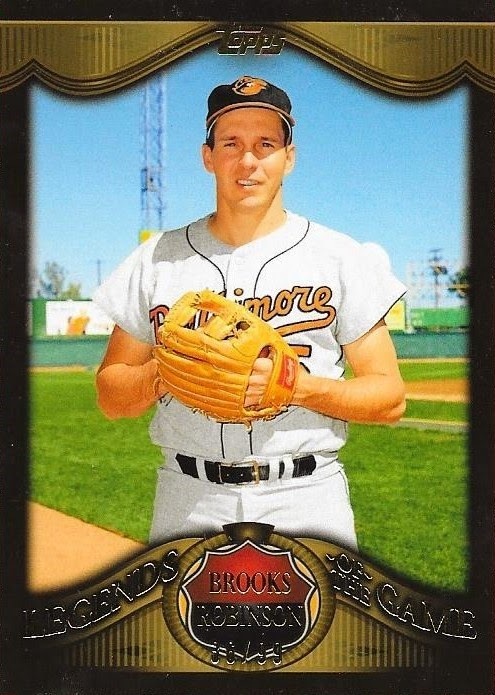 Hillshire Farm Brooks Robinson card. I had never seen these before, and it also provided me the ability to drop a movie reference in my blog. Woo Hoo. These Opening Day blue parallels look so awesome in person. I didn't have this Kevin Gausman parallel yet and Nick hooked me up! 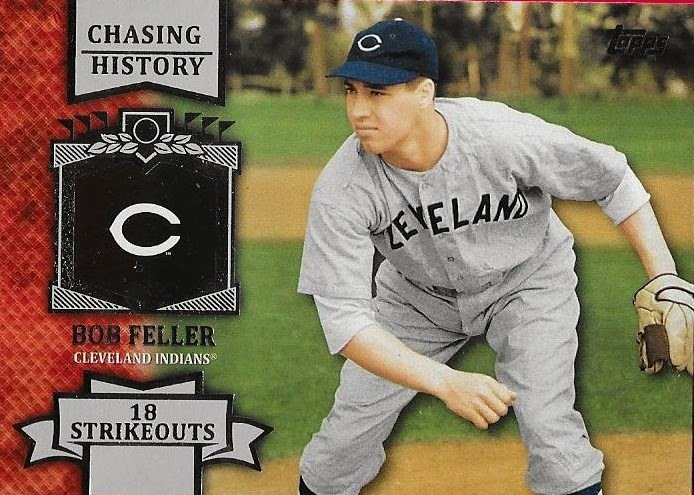 Finally, here is a Chasing History Bob Feller. I love that I PC Feller. He was a great ball player, a great American and a great man. He is still missed, and I take every opportunity to add cards of his to my collection. Thanks so much for the cards, Nick! I am slowly building a pile again for you, hopefully, it'll be ready to send sometime soon. If you guys haven't checked out Nick's blog yet, you're missing out. Please check it and give him a follow by clicking here. One of the things I miss the most from my time helping out at the card shop in Winston-Salem was when folks would bring in their cards that they wanted to sell. 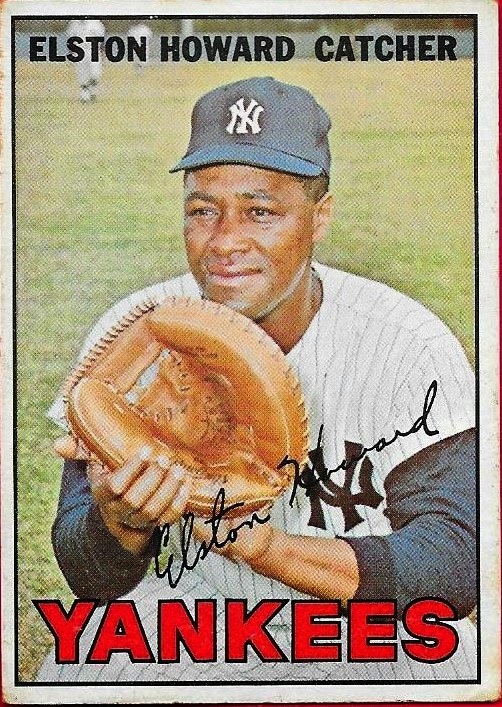 Lots of times, the cards they were dumping were garbage, but every now and then someone would come in with a shoebox full of vintage and I would enjoy countless hours of sorting and pricing the cards, and sometimes I would have the opportunity to buy the cards for myself, depending on the price that the person wanted. Well, that shop is closed, has been for 3 and a half years now, and I live clear across the state. The shop owner here in Winterville knows I am a huge fan of vintage, so when I walked in there yesterday, he handed me a stack of cards that he had just purchased off of someone. The top card was a 1958 Mantle, so I knew he scored big. There ended up being 3 or 4 Mantles, 3 or 4 Willie Mays, a '62 Clemente, a '63 Ford, several of the '62 Babe Ruth Story cards, and some other nice early to mid 60s cards. 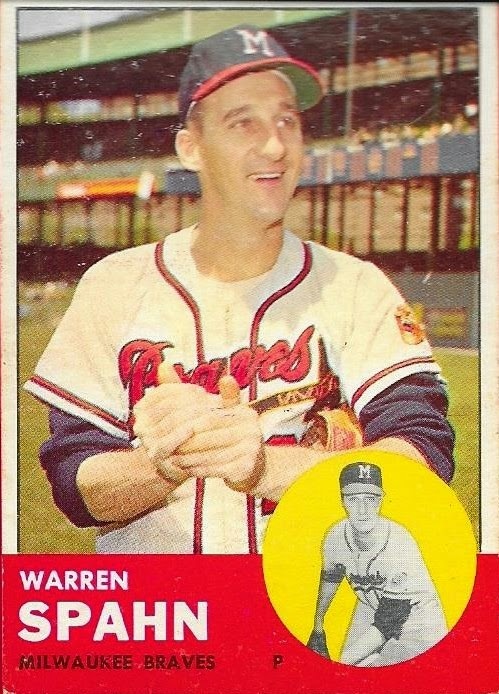 I decided that I really liked the above 1963 Topps Warren Spahn, just because, and I picked it up for $25.00. The card is in great shape, as you can see from the scan. Since Windell (the shop owner) made me a good deal, I also picked up a couple 1967 Topps cards, even though I haven't officially started my set. I got this Whitey Ford and the below Elston Howard for really good prices ($8 for Ford, $5 for Howard) and can add them to my set. I really wish they carried more vintage cards at my local shop, but they don't. I have to wait til September 27 and 28 before I can go to my next card show, so I'll just bide my time until I can get some good steals on nice vintage. I also have my birthday coming up, so maybe someone will help me with some set needs, as well. 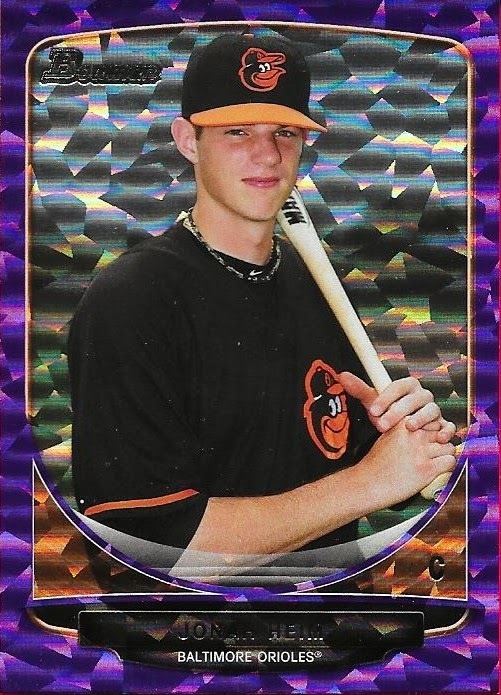 I wanted to show another card that I got off of COMC recently, this 2013 Bowman Purple Ice parallel of Orioles prospect, Jonah Heim. 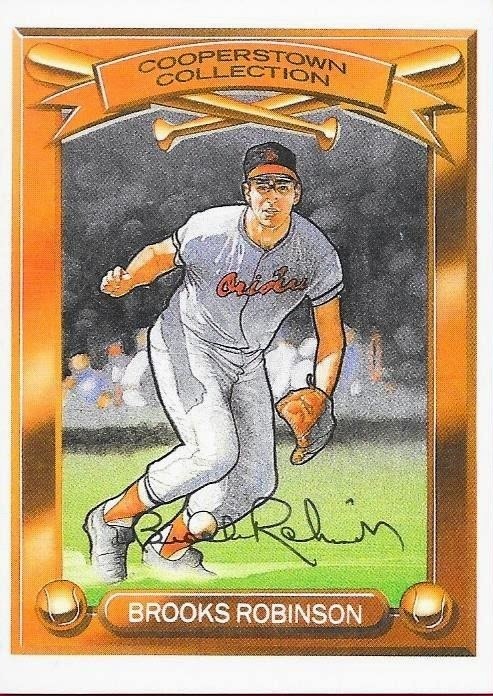 Heim was the Orioles 4th round pick out of the 2013 draft. He is currently playing for the Low A Aberdeen Ironbirds. Over 64 games in the minorsfor the last 2 years, Heim is batting .206 with 1 home run and 11 RBIs. He's going to be just fine, I think. He definitely adds to the huge amount of catching depth that the O's have drafted recently. This card is really awesome. It is numbered 6/10, and according to the back of the card, Heim tries to wear uniform number 6 whenever he can, in honor of his grandpa. That is really awesome that I ended up with this one. I got some mail from my friend, Sean, today and paired with the envelope I got from him last week, I ended up with some sweet stuff from a guy that I have traded with a bunch, so far. 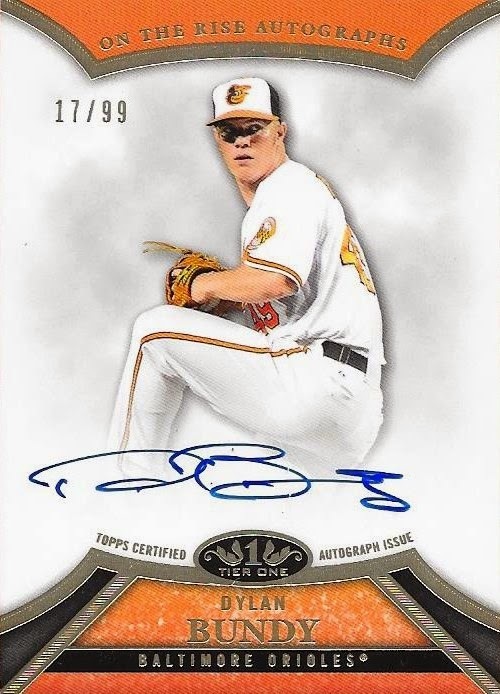 He is set to received a graded gem mint 10 minor league card of Craig Kimbrel and in return, Sean sent me this SP of Dylan Bundy from 2014 Topps. I like these Future Stars SPs and I didn't yet have the Bundy, so it was a fair trade for me. In his prior package, Sean included the above 2013 Topps Tier One (on card) auto of Bundy. Oh man, this card looks awesome in person. I didn't realize it was on card until I looked at it when I was scanning it. It looks so nice. 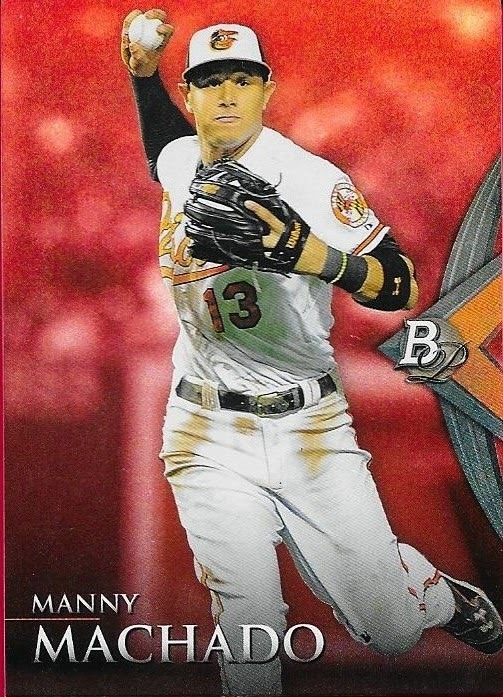 Finally, I got this red parallel of Manny Machado from 2014 Bowman Platinum. The Platinums never disappoint and this red parallel looks really awesome. Thanks for the trade(s), Sean! I really appreciate it. Your Kimbrel will be mailed tomorrow! Care Package From Max S.
A few weeks ago, I received a PWE care package from one of my regular Instagram trade partners, Max S. who operates under the Instagram name, graphinchitown. He is one of the many Cubs fans that I have met on there and we send each other stuff back and forth quite a bit. Actually, we have a trade that we finalized, which I should be seeing in the next few days. 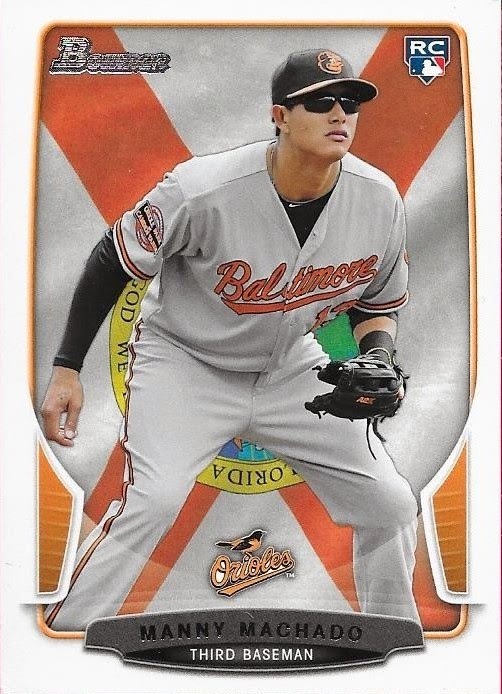 This package, however, contained a whole bunch of Orioles cards, one of which was the above Home Flags parallel of Manny Machado that I didn't have yet in my collection. 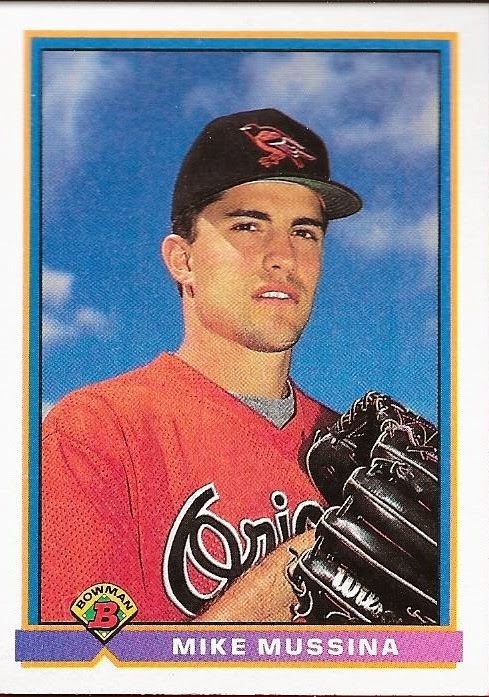 Also in the package was this 1991 Upper Deck Mike Mussina RC (I have blogged this card before, but that photo didn't scan worth a crap, so I gave it another go). Two days, two different Mussina RCs. Not bad! Thanks for the care package, Max, I really appreciate it. You should see my end of our trade in the next few days, as I mailed it off yesterday! Two Trade Packages From Alex R.
Recently, I met a trio of guys from the Chicago area who I have been corresponding back and forth with on Instagram and various forms of messaging. Sean, Shawn and Alex are their names. Each a Cubs fan, but Alex is more of a Hanley Ramirez fan. I sent Alex some cards recently as a hello and a welcome to the hobby and in return, I got two packages back from him. There were a bunch of Orioles and a few Joe Morgans in the envelopes he sent me. Funny thing, Alex found me a Cal that I didn't yet have in my collection. What an underrated design 1986 Topps was. This is actually a 2014 Archives, but the design is still really sharp, even after all these years. This really might be one of the more forgotten sets of the 1980s, but it really is a good one. 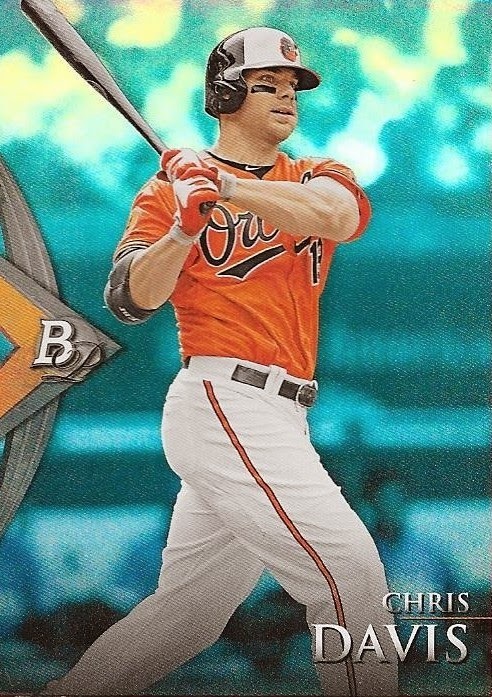 Alex was also able to find a Chris Davis card that I didn't have yet in this 2014 Bowman Platinum sapphire parallel. This is a really nice parallel. I have a gold parallel coming, so I might try to get a few others, but I won't be taking a rainbow seriously or anything like that. 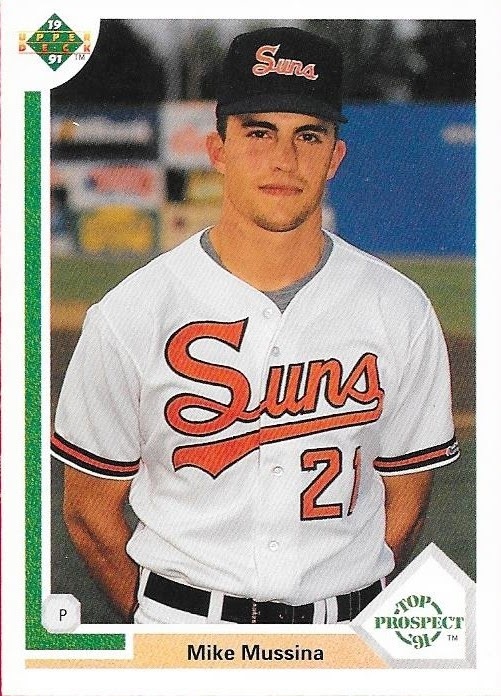 Finally, there was this 1991 Bowman Mike Mussina RC that Alex included. I'm still a big Moose fan and I truly believe he will make it to the Hall of Fame. Probably not anytime soon, but he will get in. I also love the retro O's jersey from the early 90s that Moose has on. 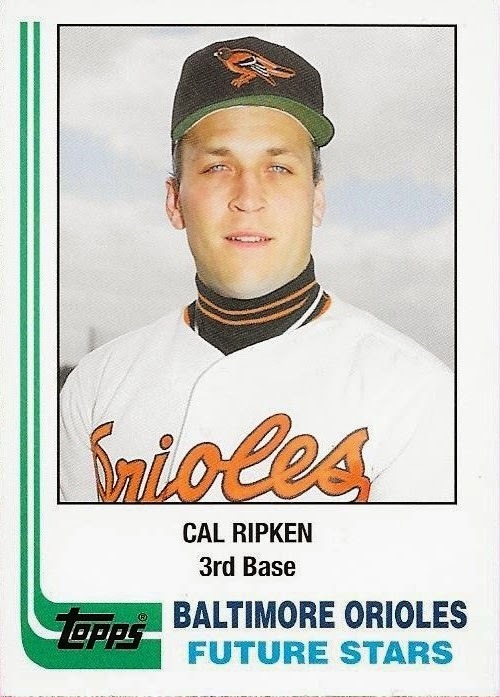 I have the black version, Ripken of course. Thanks for all of the cards, Alex! I really appreciate it, and really, welcome to the hobby! I had about $30 in store credit on my COMC account and I used it to buy 7 cards (two of which are headed out the door in a trade). I plan on blogging each and every card from the purchase and I start with this 1959 Topps Highlights Ernie Banks card. This is #469 of the set, so that knocks something off of my wishlist. 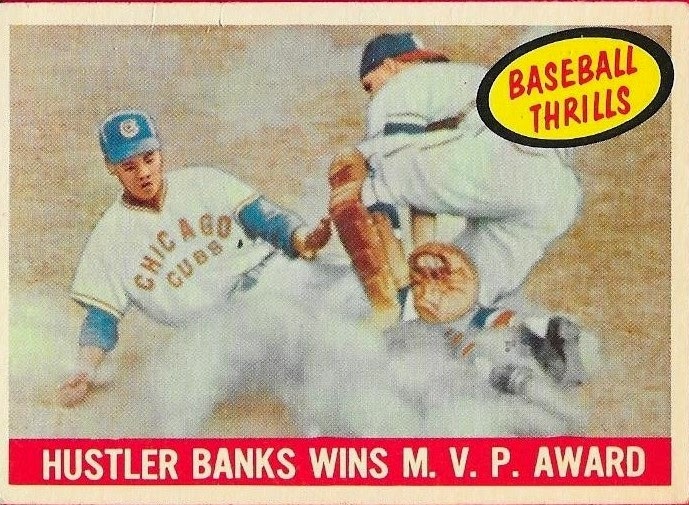 Banks has quite a few cards in the set and I already have his base card, so getting this one helps me out. I still need his All Star card and his duos card. I got this for $4.30. I made offers on each and every card I got in this lot and each offer was accepted. I was trying to stretch my budget on there and I feel like I did a pretty good job. Stay tuned to see the rest of the cards I got, as well as a ton of trades that still need to be posted. I was very pleased recently when I got a message out of the blue on Instagram from a fellow who also enjoyed building vintage Topps sets. Rob, was his name, messaged me telling me he had a ew partial sets of various years of Topps and was gauging my interest in some of them. 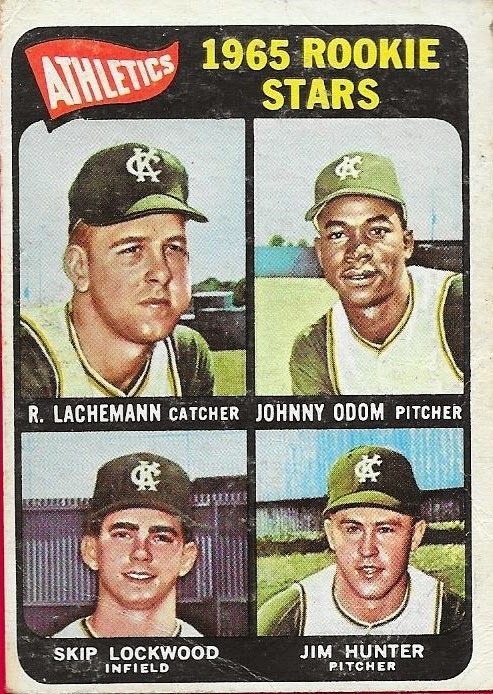 One of which was a partial 1967 Topps set for a very reasonable price. The cards were low to mid grade, but mostly nice. There are a handful that I will upgrade due to paper loss or writing on the cards, but most of them were fine. I already had a handful of 1967s here that I had been hoarding, so I upgraded a few and even plugged a few holes in the set with them. In all, from Rob, I got 254 of the possible 609 cards in the set, or approximately 42% of the set. I haven't added my Aaron or Mantle to the set, yet, as I haven't officially begun the set. I want to try to get 1959 and 1969 finished first, that way I can do 1967 and maybe 1972. Hopefully, that will be really soon (especially 1959). Thanks for the deal, Rob. If anyone is interested, he has partial sets of 1969 and 1971 Topps and can be reached via his website, robbessette.com. 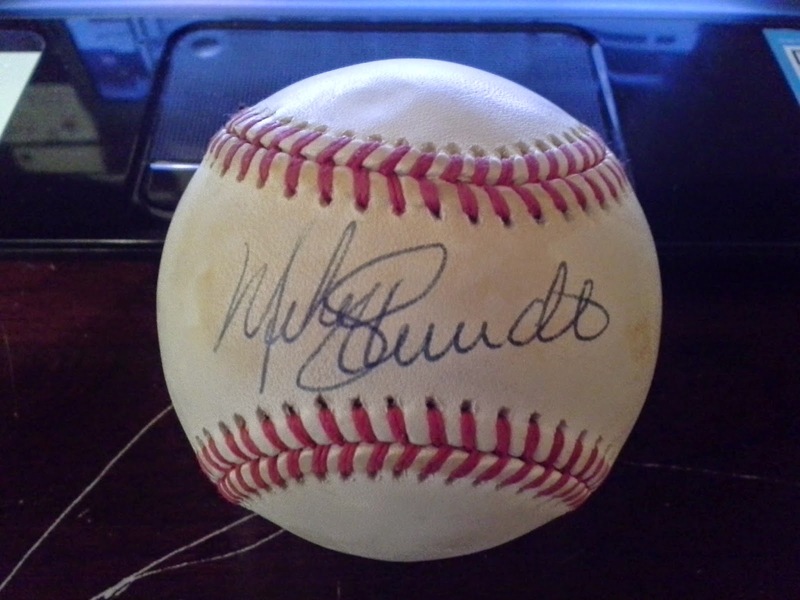 The other baseball I got from the latest collectauctions.com auction was this Mike Schmidt signed baseball. It is a Leonard Coleman ONL baseball that shows some minor toning. Schmidt (b. 1949) played in the majors from 1972 to 1989, all for the Phillies. Schmidt had 2,234 hits, 548 home runs and a career .267 batting average. He was a three-time NL MVP (1980, 1981 and 1986) and won the World Series with the Phillies in 1980. Schmidt is regarded as one of the greatest third basemen of all-time (I'd argue that Brooks is) and his 548 home runs are 15th all-time. Schmidt was elected to the Hall of Fame in 1995 (his first ballot) when he was named on 96.5% of the ballot (8th most all-time). Schmidt is my 105th Hall of Fame signed baseball. Another auction has ended over at collectauctions.com and I came away winning 2 lots. One lot was this signed baseball of Willie McCovey, and the other lot was a lot of 2 balls, one of which I needed for my Hall of Famers (the other ball is someone I have already and will sell for $60 shipped - Wade Boggs). All of the baseballs came with PSA/DNA certifications and each looks really nice, save for a few marks on the Boggs ball (which some rude kid pointed out to me on Instagram, even though it was pretty visible on the pic I showed). So, the auction was very successful for me and I was able to push my total up by two. 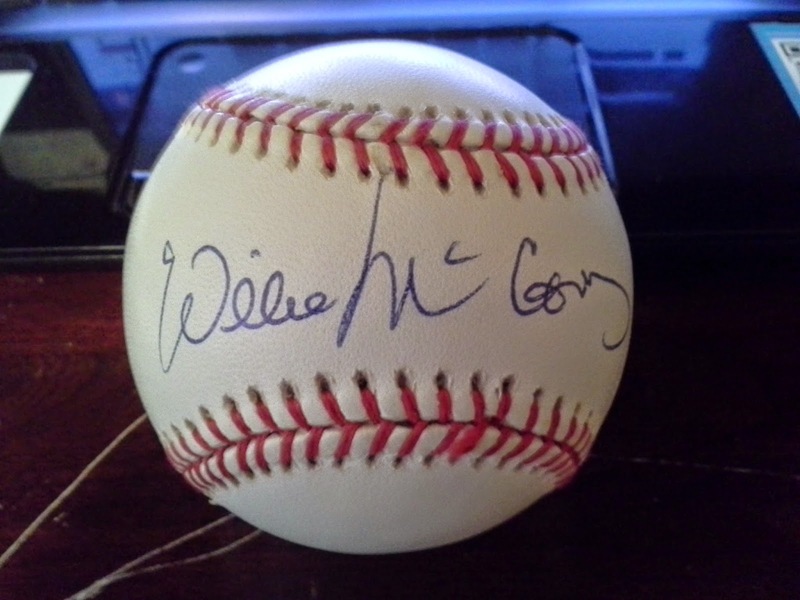 Ball #104 in my collection is the above Willie McCovey signed William White ONL baseball. Man, it's sharp! McCovey (b. 1938) played in the majors from 1959 to 1980 for the Giants, Padres and A's. He had 521 home runs, 2,211 hits and a .270 lifetime batting average. He was the 1960 NL Rookie of the Year and the 1969 NL MVP. In his career, McCovey hit 35+ home runs 6 times, his most being 45 in 1969. Something I noticed about McCovey, though, was that in 1963, he hit 44 home runs with a .280 batting average and followed that season up with a dismal 1964 campaign where he hit 18 homers with a .220 batting average. This made me immediately think of the season that Chris Davis is having this year. Interesting to say the least, especially since McCovey bounced back for six straight 30+ seasons after 1964. McCovey's 521 home runs are good for 18th all-time where he is locked in a three-way tie with Frank Thomas and Ted Williams. A 6-time All Star, McCovey played in only one World Series, 1962, and lost to the Yankees. He was elected to the Hall of Fame in 1986 (his first ballot) with 81.4% of the vote. I joined a box break on Instagram some time ago (I was on vacation, actually) and the results finally were revealed last week. I bought in for 3 slots at $4 each ($12 total) and ended up with the Cubs, Red Sox and of course, the Orioles. The biggest thing about the break, though, was that I got the numbered to 10 parallel of Cubs prospect Javier Baez. Now, I'm no prospector and when the facilitator of the break let me know I pulled it (thanks to him for being honest, too), he immediately asked if I'd trade it. I told him I absolutely would, if he had some good vintage cards. 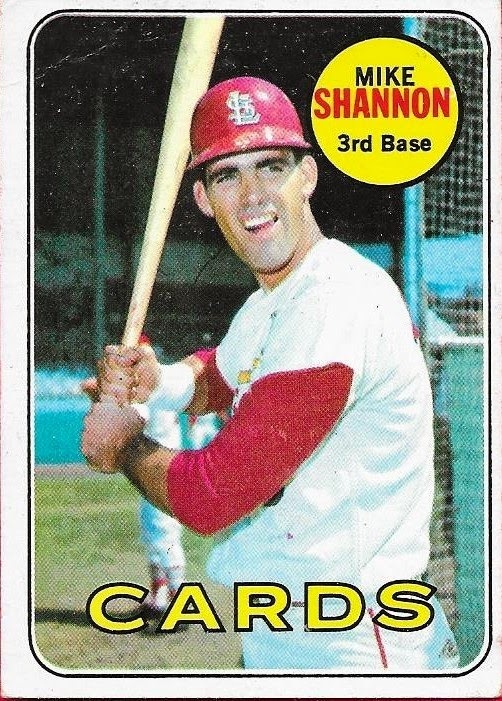 Well, he first showed me the above Catfish Hunter RC, which I was really close to calling it a deal at just that card. However, I got a bunch more pictures on my messenger, and I wasn't about to turn them down. 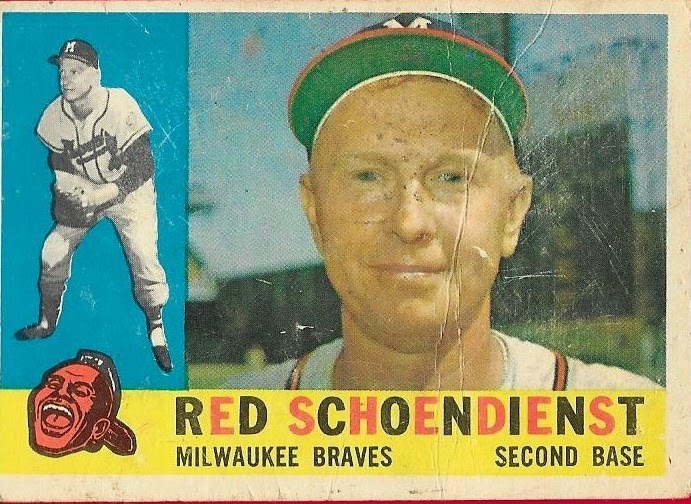 In the end, I got the Hunter RC, the below Red Schoendienst from 1960, a 1959 Topps for my set (Joe Ginsberg), 1962 Juan Marichal, 1968 Phil Niekro, 1974 Reggie Jackson, 1968 Gaylord Perry, 1972 Willie Mays (in action), 1967 Boog Powell, 1965 Paul Richards and a 1971 Schoendienst. So, by my count, I got 8 Hall of Famers (one of which was a RC), one set need, one Oriole legend (Powell) and a former Oriole manager. The cards were in various stages of condition, with the Schoendienst being the worst of the lot, but I am so very satisfied with the trade. I know that Baez card might be hot now, but these Hall of Famers will forever be Hall of Famers. 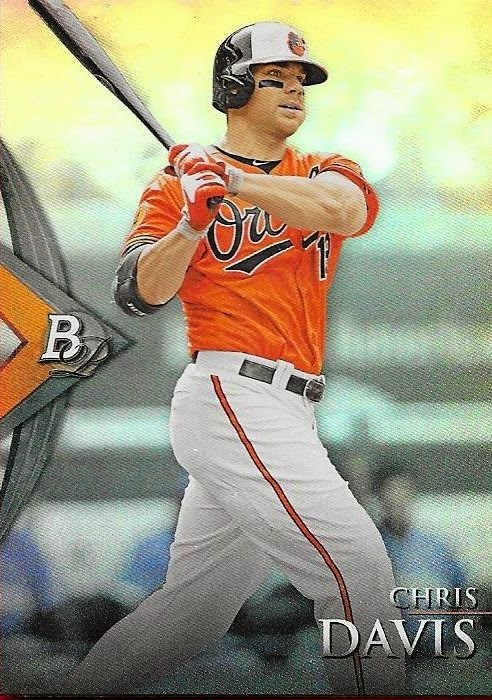 Finally, I did get some good Orioles, like this Chris Davis. I also got the chrome parallel of Baez, so I still have a little trade bait left over! It can be hard, sometimes, keeping track of all of the people I've met and traded with. This is very true recently with all of the instagram and kik messenger deals that I have made. One of the people I've met that I really have taken a liking to is Jake. I've posted about him before, when I got a Jeter Minor League card in exchange for a Bryce Harper RC. 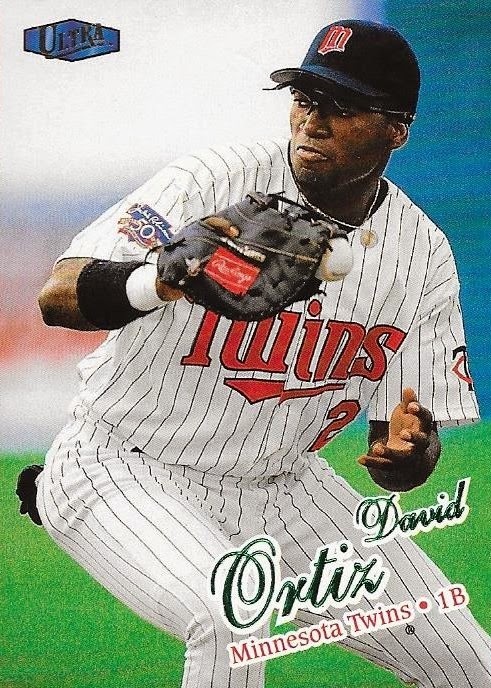 This time around, I sent Jake a couple 2014 Bowman Kris Bryant cards and in return, he sent me this early David Ortiz card, a 1998 Fleer Ultra. This isn't (obviously) his David Arias RC, but it is still a cool card. 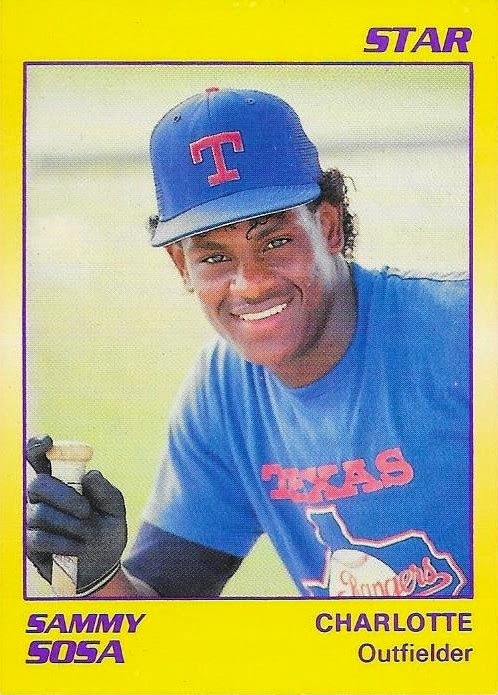 The other card Jake sent was this 1990 Star Minor League card of Sammy Sosa when he played for the Charlotte Rangers. Look at his hair. Gotta love the early 90s. Anyway, Jake is a really awesome guy and I am glad to have completed another trade with him. I know we will be doing some more, especially because we are in negotiations for one right now! Probably a forgotten set from the past, I had my fill of Topps Unique quickly after it first came out and judging by how it hasn't popped up again, it looks like most of the consumers did as well. That being said, the set was ok. 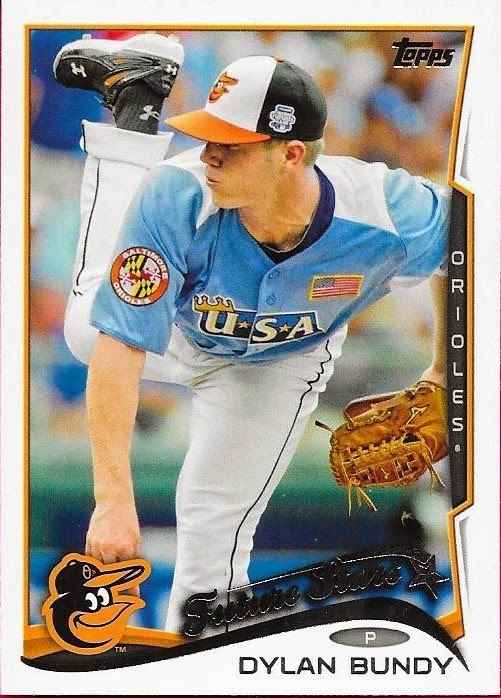 There were a few decent Orioles RCs at the time, namely Nolan Reimold and Koji Uehara. 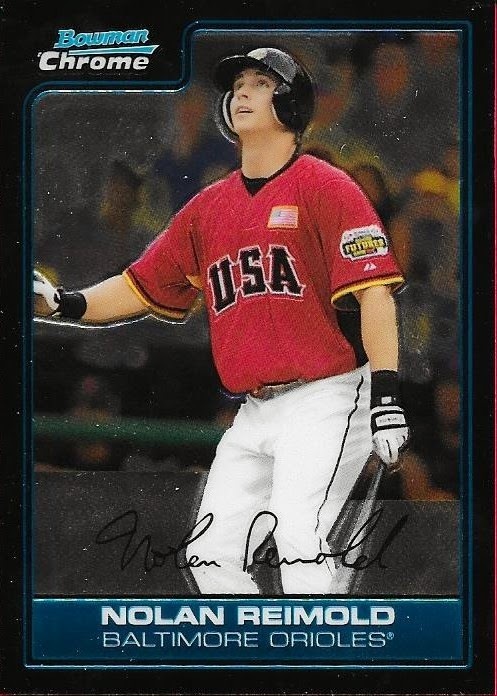 I hod completely forgotten that there were gold parallels in the set until I saw this Nolan Reimold parallel on Ebay for $1.25, buy it now. So, I picked up the card for my Nolan PC, I mean, numbered to 99 and at that price (with free shipping), I couldn't go wrong. So, I now have the gold parallel. I don't know if there are any lower numbered parallels, so I guess I need to take a look and see. The card scanned pretty nicely as well, as you can see. I wonder if Topps will ever try again with Unique. I think the premise was the opportunity to get good hits, like buttons and laundry tags or something like that. I never got one, that's for sure. I told you guys I was a fan of the color parallels for chrome cards. This has also applied to Panini Prizm cards, apparently. 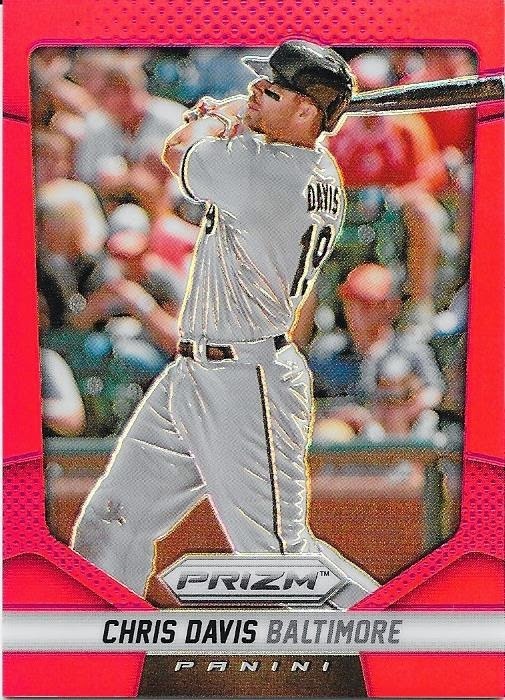 I saw this 2014 Panini Prizm Chris Davis red parallel on a kid named Aaron's instagram and worked out a deal with him in a couple of minutes. He wanted $12 for the card, but I worked him down to $9. I think, since it is numbered 24/25, I did ok. I wanted to spend a little less on it, but really, what's a few bucks? The card looks awesome. It scanned great and I think I'm going to look up some more of the parallels once things calm down around here. Thanks for the deal, Aaron! I made a quick and easy one for one deal on Instagram with a guy named Luke for this 2012 Topps Gypsy Queen Tim Lincecum relic in exchange for a 2006 UD Artifacts David Wright relic. This had to have been one of the easiest trades I have ever made, as Luke and I reached a deal within something like 5 minutes from initial contact. Luke turned out to be a really cool guy and has already added me to one of his trading groups on Facebook. 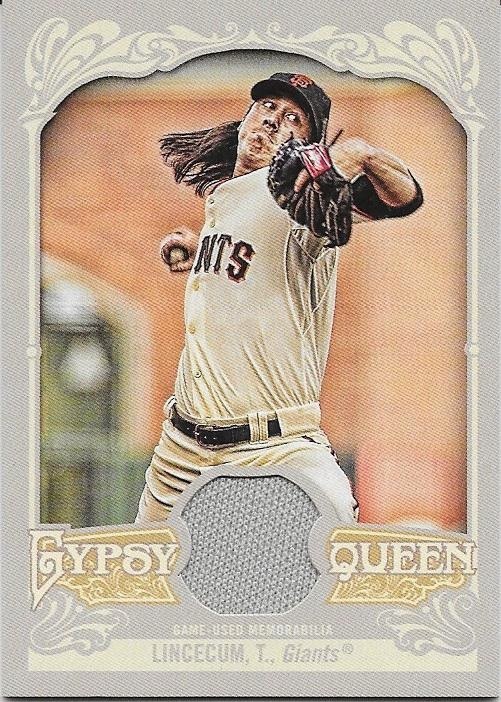 I'm sure you all know where this Lincecum is headed, it is on Chris's desk waiting on him to get home from visiting his grandparents. I know he will be excited when he sees it. Thanks for the trade, Luke, I really appreciate it. I hope you enjoy the Wright relic, I've had that thing for years! I made a quick and easy trade with a kid named Sage on Instagram recently when I picked up this 1978 O Pee Chee Eddie Murray rookie card in exchange for some low end relic cards. 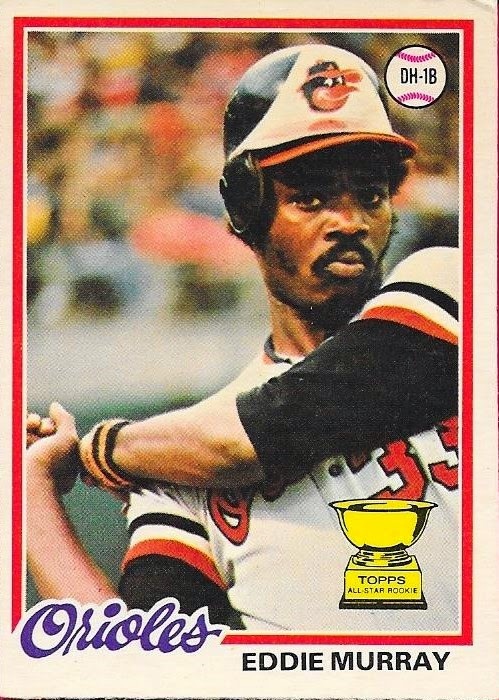 Initially the trade was for a 1978 Topps Eddie Murray RC, but Sage wasn't able to tell the difference between Topps and O Pee Chee, a common mistake. The back of the card is a different shade and there is French as well as English writing on the card. Luckily, I had been in talks to get one of these with someone else, those talks had stalled, and I now surprisingly end up with this one. It all worked out. Thanks for the trade, Sage, I appreciate it. I told you that I loved these clear parallels. 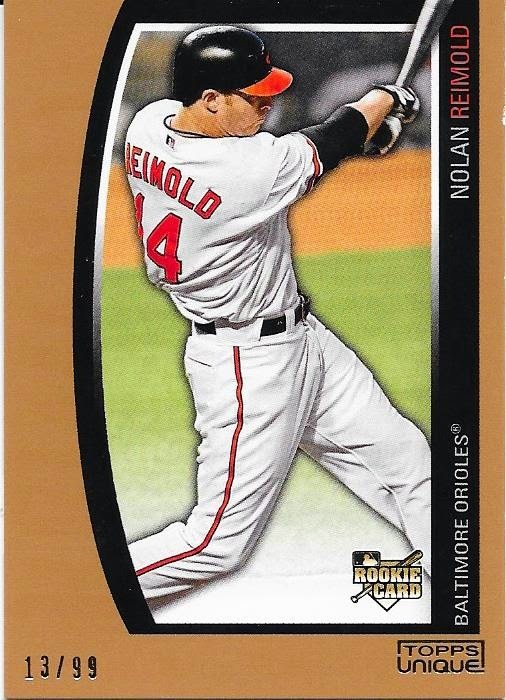 I saw this Nolan Reimold numbered 7/10 on Ebay the other day that was a buy it now/best offer for $29.99. I noticed that someone had put in an offer, but it was still pending. I thought about it for a minute and decided that I would just go ahead and do the $29.99 and not risk losing the card to the offer. I know I overpaid, but a card is worth what you're willing to pay for it, and I was willing to pay $29.99 rather than risk not seeing another. I love the card and now have a bunch of Nolan's 2014 parallels. I still am not really taking the rainbow pursuit seriously, until I see a platinum somewhere. I doubt I will. I was unable to attend the National this year because of my extensive vacation to Michigan and Illinois. I really wanted to go, but there was no way I was going to be able to afford it. Luckily, my friend, Eric, sent a few things my way from his visit to the National. 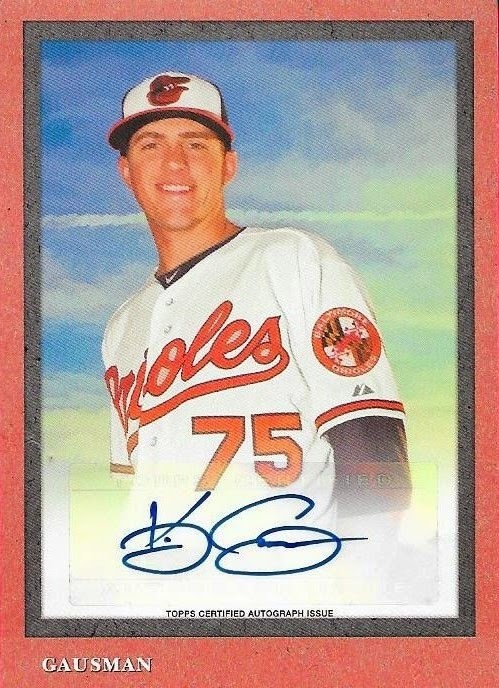 Above is a really sharp looking Kevin Gausman 2014 Turkey Red auto that is numbered 454/499. I hadn't had a chance to pick up any Turkey Red at all last year or this year. I saw the Gausman before, but couldn't get my hands on it. Thankfully, Eric thought of me when he saw it and grabbed it. 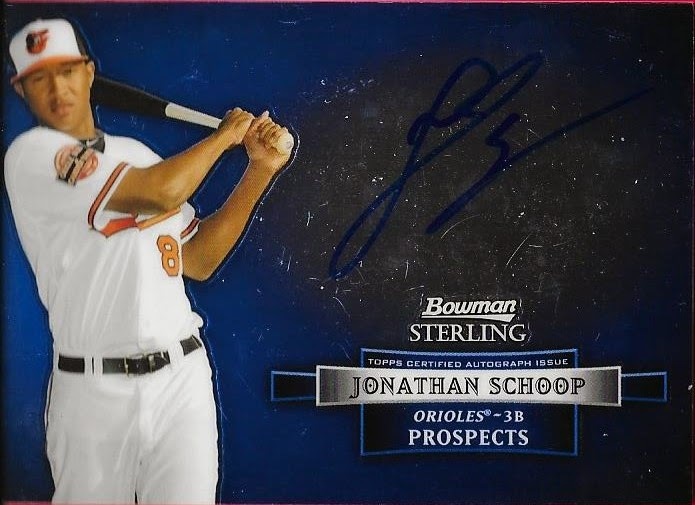 Eric told me he found this Jonathan Schoop auto in a $4 bin that was slammed full of cards. What a deal! The card didn't scan as good as it looks in person, but I assure you, it looks great. 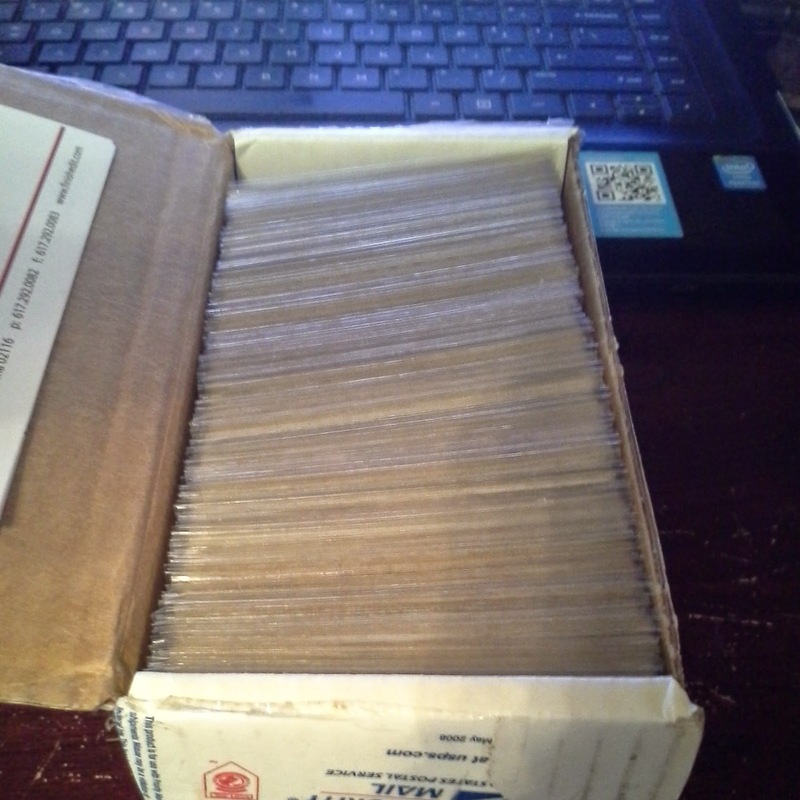 Finally, Eric sent me 14 1969 Topps that I needed for my set. Even better, 10 of them were high numbers, so that really helps me along with my set! They are all in awesome shape, too! Thanks for the cards, Eric. Expect some great Twins cards in your mailbox real soon! I got a surprise package in the mail recently from my good friend, Alex, over at the blog: Chavez Ravining. Alex is an awesome guy who I have talked to quite a bit in the last year. With his being a Dodger fan, I have been able to send him quite a bit of stuff since I no longer have a former friend around who was a Dodger fan. Alex gets to cash in on that. Alex sent me a really awesome package that had a ton of Orioles in it. 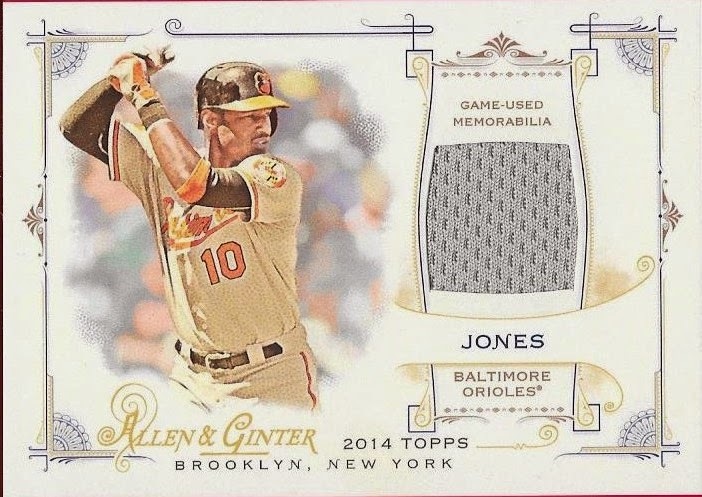 I really liked the 2014 Allen and Ginter Adam Jones relic. Ginter has been around a while now and I feel like it has lost its luster, but this card is really sharp and I appreciate Alex including it in the package. 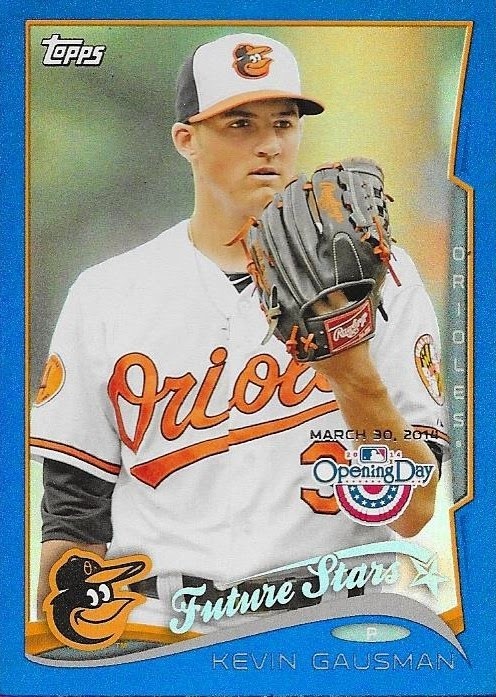 Another cool card was this blue parallel from 2014 Topps Opening Day. This scanned really nicely and looks so awesome. Thank you so much for the cards, Alex, I really appreciate it. You'll see some more Dodgers in no time, for sure. 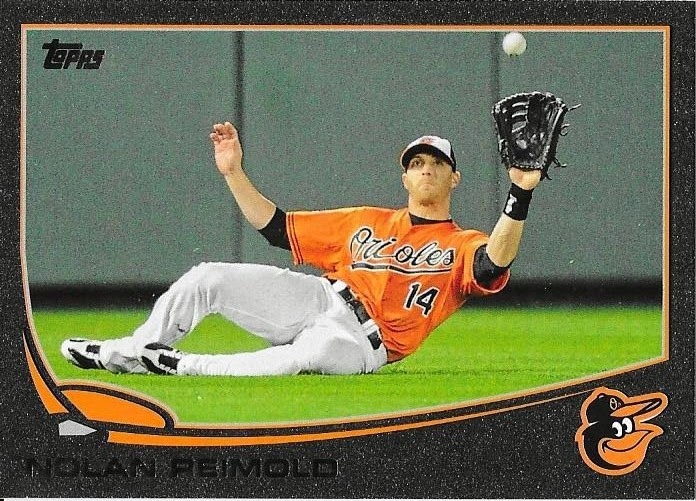 Recently, I got a couple 2014 Topps Nolan Reimold parallels in a surprise package from my buddy, Matt, a fellow Orioles fan on Instagram. Matt sent me a 2014 Topps Nolan Reimold black parallel numbered 47/63 and the above green parallel. I already had a black parallel, but since they are so tough to find, I was more than pleased to add another to my collection. 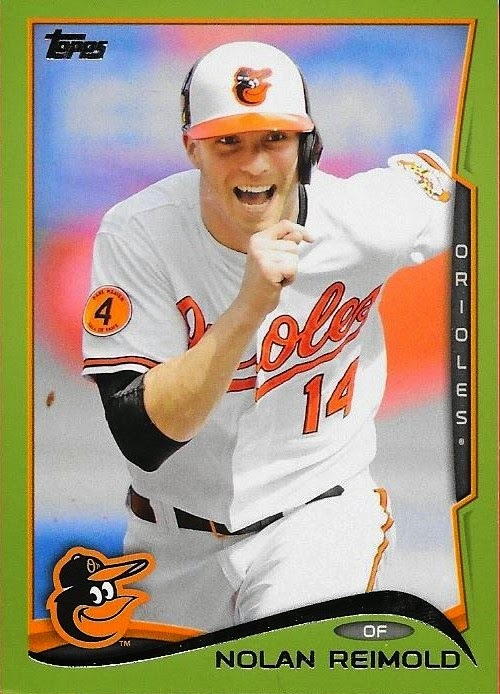 The shade of green used on the above card isn't the best known shade of green (looks kind of like pea soup, or something else...) but it actually looks really nice with the Orioles colors. Not too bad, I guess. Anyway, thanks for the surprise package, Matt, I really appreciate it! Surprises make me happy. Surprise packages from fellow collectors whom I've built a great rapport with that include cards for my son make me even happier. I've been talking with Michael S. since I was on my vacation and I picked him up some 1958 Topps set needs. He's a really super guy who coaches football at a local high school in Texas. An Astros and Rangers fan (mainly Astros), Michael has been talking to me via Kik messenger every day since our initial contact a month ago. 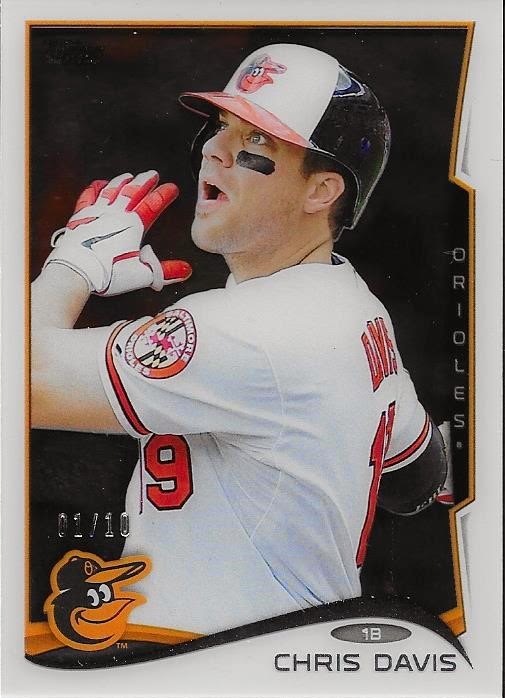 Michael sent me a really nice package of some Bowman Chrome Orioles (most notably this Nolan Reimold from the Futures Game) and a few other Orioles cards. Additionally, Michael included some Giants cards for my son, Chris. 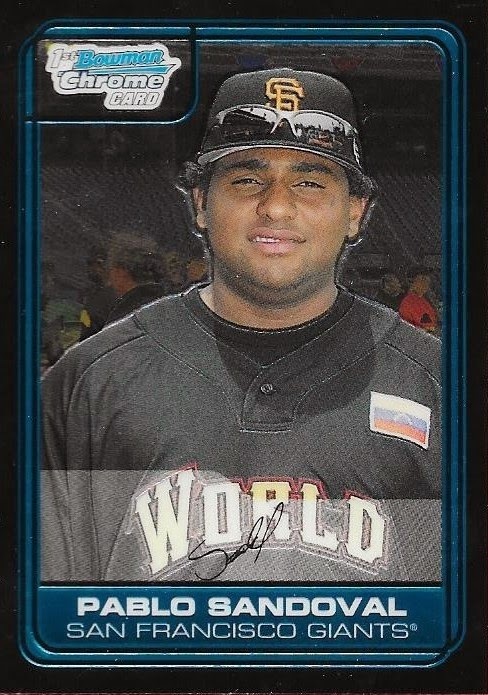 The above Pablo Sandoval Bowman Chrome rookie blew me away when I saw it. This card is really awesome and I know Chris will feel the same when he sees it (he is at his grandparents' house right now). So, thanks for the surprise, Michael. I really appreciate it! We'll have to continue to do more trading in the future as well as continue our conversations on sports, life and collecting. Thanks! I have met a lot of interesting people while trading on Instagram since I started on there back in November. A good many of them, I call friends. Apparently, in my "just being me", I have earned a reputation as being one of the nicest traders on there. I do my best, for sure, but I act on there the same way I act everywhere else, respectful, professional, friendly. One of the guys I've met on there who has struck me as one of the most appreciative and genuine is a kid named Jake Ignaszewski. He is primarily a YouTuber, but also does some trading on Instagram as well. I traded with him before and got a Derek Jeter minor league card. In return, I sent Jake some Red Sox and Astros cards, his favorite teams, along with a Bryce Harper RC (the original piece of my end of the deal). Jake posted a really awesome YouTube video recap of the trade, which made me really happy. So, I added Jake to my regular roster of trade partners and when he asked me for a couple Kris Bryant cards, I didn't hesitate to oblige him. In return, he sent me some Orioles base cards from 2005 and the above 1991 Topps Frank Thomas second year card. 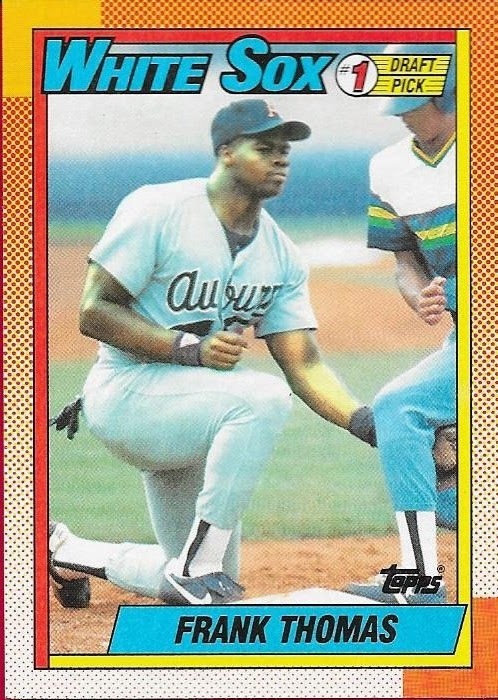 Jake mistakenly thought this was the Big Hurt's rookie card, but that card is 1990 Topps. No big deal to me, I still like the card and am glad he sent it. The monetary value of the card is probably far less than what I gave up, but that wasn't my reasoning behind making the deal in the first place. Jake is a young guy who has a great enthusiasm for cards. He might not be able to go out and buy cases of Topps, but the cards he has, he cherishes. So, for me to be able to dip into my Bowman stash and give him a couple cards he was looking for, well, that was reward enough for me. I really enjoy helping young folks grow their collections and I also enjoy being a mentor of sorts for them in the hobby. I have been surprised by the amount of questions I get from people on a daily basis, from which sets to build, how to build sets, how to do TTM, who to send to TTM, etc. I suppose you could call me a grizzled veteran of the hobby now, and I figure that's about right. I started in 1990, stopped in 1996 and then started back up in 2005. That makes about 15 years experience in the hobby, so I guess I know what I'm talking about from time to time. I just enjoy helping people and making this hobby grow by providing a positive example, because, we all know there are bad elements in the hobby. From certain card buyers who you see being used as the face of the hobby (you all know who I'm talking about) to some card/memorabilia shop owners who make you feel like you are inconveniencing them by setting foot in their stores, the hobby needs better people in it. So, I appreciate Jake, and all of the other young folks I have met while trading on Instagram. I feel like the hobby has a bright future. Thanks for the trade, Jake, I know we will do many more. Also, if anyone would like to check out Jake's YouTube, here is a link. Ok, just so you all know, I love these clear acetate parallels. I've loved them since Marvel started putting them in their cards back in 1993. They just look so cool. I was really into Upper Deck Element when they came out and I was really excited when I saw that Topps was doing the clear parallels in 2014. 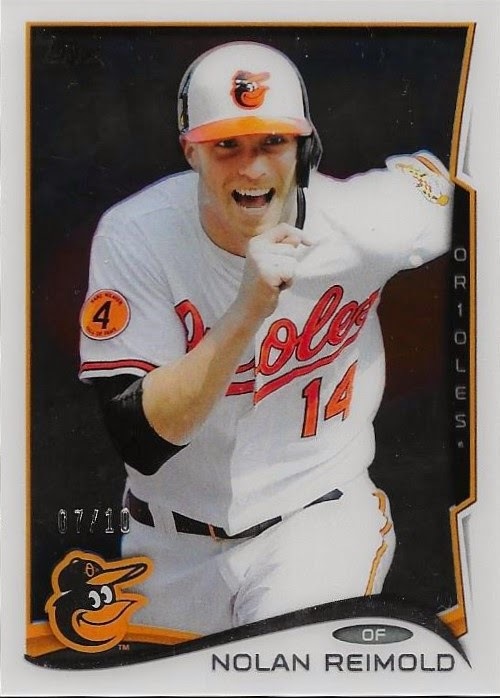 I got so lucky on the Series One Chris Davis in that no one knew about the cards yet and I got mine for less than $10 on Ebay. Unfortunately, word spread about them and they started going for $40 - $50 thereafter and became increasingly hard to find. When Series Two came out, I had to be vigilant on grabbing a Davis because I knew that if I didn't grab one right away, I may never get another chance. I searched and searched Ebay after Series Two came out, but hadn't seen a clear Davis show up until a month or so went by and I saw this one. Numbered 1/10, I bid on it right away and waited. I made sure that I bid high enough that no one could swipe it from me, and I ended up winning the auction for about what I expected, just above $40. Ouch. Well, I figured I would have to pay a premium this time around, and was prepared to do so. I'm happy to have this card in my collection. I still am PCing Davis, even though he has had a horrendous year. My opinion is that he came back too soon from his oblique injury and hasn't fully healed. I sure hope he can get his stroke back this season, because the Orioles offense is struggling. It has only been 6 games, but I wonder if the Orioles are regretting the fact that Nolan Reimold was claimed by the Blue Jays. Nolan has 6 hits and 2 home runs in those 6 games and a .353 batting average. His 2 home runs came in the same game (last night), which came as no surprise to me. If Nolan can stay healthy, he will likely be a 30+ homer bat for whichever team he is on. I hope that he can keep it up for the Jays (as long as it doesn't help them pass the Orioles in the standings, of course). I got this card for a really good price (which I can't remember) on Ebay before I took my vacaton and it was here waiting for me when I got back. I have slowed down on my rainbow pursuits, mainly because the completion of a rainbow is so dang impossible, with the 1/1s and blank backs, etc. Uggh. Anyway, I'm still going to get Nolan's cards, cause he's still one of my favorites. Fingers crossed that he stays healthy and gets a good contract for next year. Who knows, he may even be able to come back to Baltimore. Oh, the card is numbered 2/62.